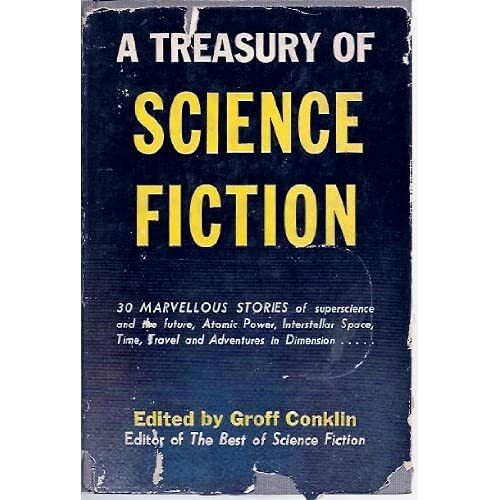 I propose to read at least two stories a month from science fiction anthologies edited by Groff Conklin, and to report here. The earliest one I have is The Best of Science Fiction (1946), and the most recent in my collection is Another Part of the Galaxy (1966). Conklin died in 1968, so I suppose one could say that the conclusion of his anthologizing coincided with the arrival of the New Wave. It would be great if other Chronsfolk read around in Conklindom and also commented here. 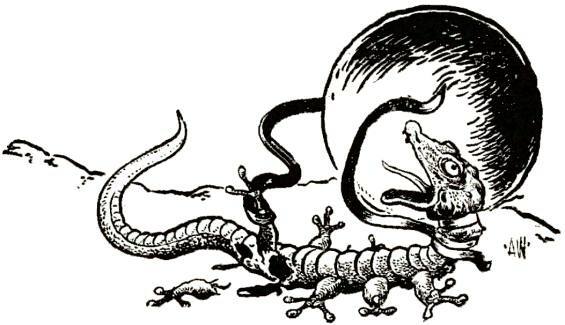 OK -- here's my first selection: "The Flame Midget" by Frank Belknap Long, from The Best of Science Fiction. I hope that someone skeptical about this new "science fiction" and seeing that this thick book was a selection of "the best" didn't start with this little story. A scientist finds a tiny goblinlike humanoid on a microscope slide, which telepathically communicates its story, the radioactive power of its body, and its people's plans for invasion. (I like better Katherine MacLean's "Pictures Don't Lie," which Conklin reprinted in Invaders of Earth -- published 1952.) 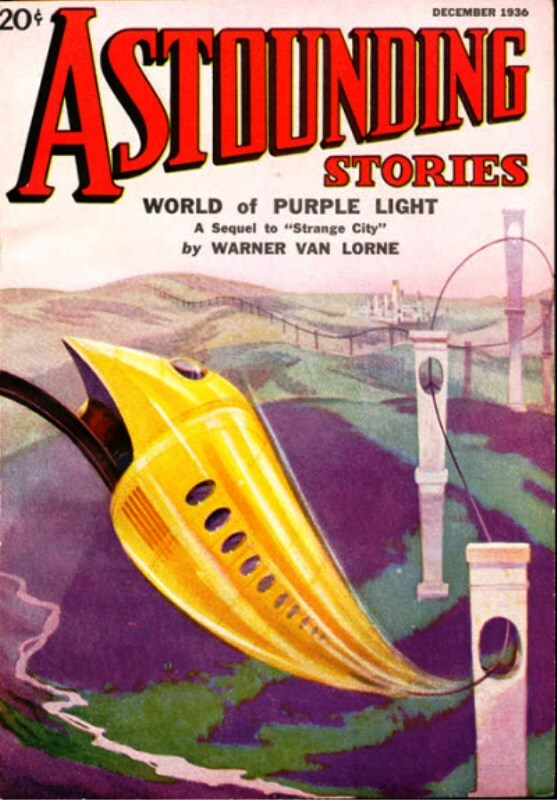 I take it this is the cover of the issue of Astounding in which the story first appeared. 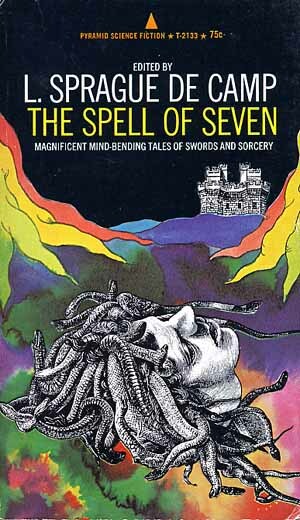 Incidentally -- does anyone know any stories by Frank Belknap Long that seem really quite good? 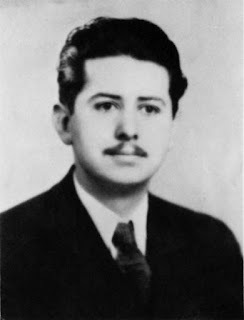 I have read little by him, but it seems to me that even when I was reading just about all the Lovecraft stuff I could find, and was also reading around in the "Lovecraft Circle," I didn't discover anything by this author that did much for me, personally. Also, I confess I don't know how to pronounce his middle name; is the K sounded? I think I'll rate the stories with off-the-cuff assessments -- sense of wonder or other special qualities (could even be just a special image), craftsmanship, style, etc. Five points possible. I read this edition, a newer modified version of yours, only 21 stories at a quick count instead of the 40 you have. Those 19 are the ones I really want to read. The copy that I pictured isn't mine, but my coverless edition does have 40 stories. You're right -- some of the thick Conklin originals were reprinted in reduced editions with the same or different titles. Contento's index (available online) can help one to avoid disappointment. Contento online? Didn't know that. Good news indeed. Thanks for the tip. I've read a few stories by Long and have come to the not very scientific conclusion that he is a very good writer who doesn't write very interesting stories. So far, that is. 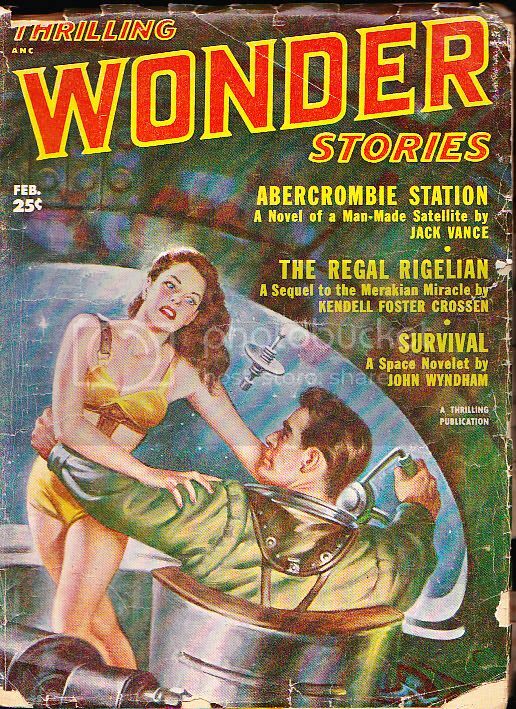 Frank Belknap Long's "And Someday To Mars" may be found inside. As you say, 2/5 when the light is shining. Must be about 35 years ago that I read his Lovecraft: Dreamer on the Nightside. I'll have to look up the review I wrote. I remember that I didn't think it was very good. How about it -- are there any Long advocates out there who'd care to speak up for good items by him? 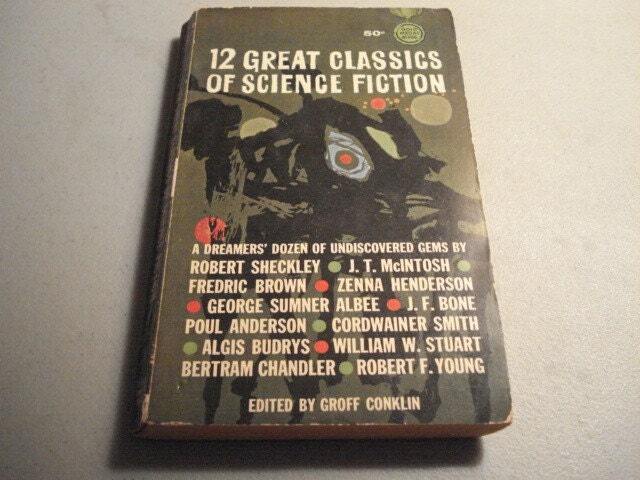 My second story is Poul Anderson's "The Light," in Conklin's 13 Great Stories of Science-Fiction (numeral and hyphen as on book cover), from 1960. I think that you need to look at the London version of Leonardo's Virgin of the Rocks to appreciate this story. It is the version on the right in the illustration below. But I'm not sure that this -- or any other reproduction available on the web -- quite gets at the quality in the original painting that Anderson wanted to suggest in his story. The story concerns the first men on the moon, and has a Cold War theme. I'm hoping lots of Chronsfolk will chime in here. Why a thread on Conklin's anthologies? 1.They were historically important. 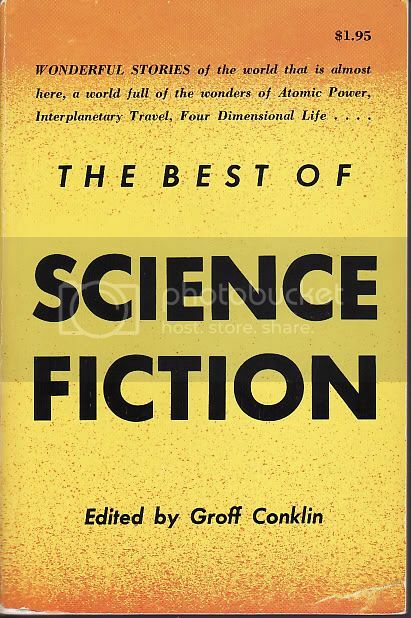 [a] Conklin's Best of Science Fiction was either the first hardcover sf anthology or one of the first. Its immediate hardcover successors were also early and notable volumes. Quite a few of them penetrated the public and school library market, and, thus, became key books in many readers' early exposure to sf. 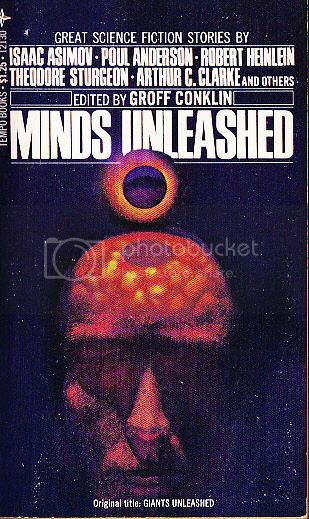 2.Conklin has a reputation as one of the best pre-New Wave sf anthologists, sustained through quite a series of paperback anthologies. 3.Many of us have some of his anthologies, I'm sure, and for those who don't but are interested, it should be easy to buy some of them at low prices; they are readily available. However, we might find there are stories we haven't read yet, and ones we'd enjoy reading again. Observations could be shared. My third story -- Algis Budrys's "Due Process" in 12 Great Classics of Science Fiction (1963). This was a futuristic tale of corporate business intrigue that didn't intrigue me. Budrys is a hit-or-miss author for me. Two of his short novels, Who? and Rogue Moon, are big favorites, while it took effort to finish The Amsirs and the Iron Thorn. As has been the case for some time, I'm afraid I won't be able to join in with the reading/reviewing of any of these (more's the pity, as I have a great fondness for Conklin's anthologies), but I may still be able to contribute a few things now and again. 2.) Long is a writer I feel very ambivalent about. When he is good, he is very good: he can create an atmosphere which is extremely powerful; he often has exceptionally good concepts; and he wrote some of the best "thought-variants" (as such) in the genre. But his execution is very uneven, and even his best often slide into farcically mechanical or wooden episodes now and again, whereas several of his denouements are simply silly. A rather disappointing practice on the part of a long-time professional writer (though hardly unprecedented). Thanks for those comments, JDW. Would you like to specify a story or two that you think shows the best of what Frank Belknap Long can do? 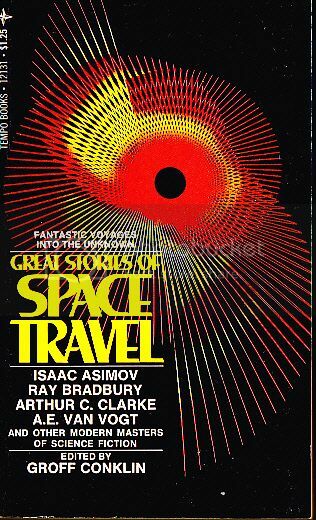 My fourth story is Fredric Brown's "Arena" in Big Book of Science Fiction (1950, with no "The" on title page or spine), a story that I must have first read back in the Seventies in a volume of the Science Fiction Hall of Fame edited by Silverberg. I doubt that the story would be selected for this honor now, on account of the implied fate of the invaders' race after the earthman defeats their representative in single combat under the observation of a "godlike" entity. When the story was adapted for a first-season Star Trek, the fate of the invaders' race was changed. 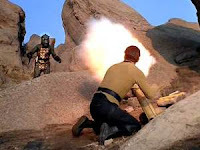 Also, the Roller was changed to a slowly-moving Gorn who wore a leopardskin toga. The Outer Limits teleplay "Fun and Games" may owe something to Brown's story without acknowledging it. Brown works out his clever idea pretty well, but for me there's no doubt that the story falls short of ranking with the very best. For one thing, the story needs to be one of character* a little more as well as plot, since the stress of the bizarre circumstances forces into display the inner qualities of the protagonist. About all that we see is that he is quite competent. Also I thought that the issue of his thirst was a bit distracting, in that well before the end of the story we are led to think he can't go on without water, a matter that generates suspense, but then Brown just has him keep going though he's very thirsty. If the point is that the protagonist underestimated what he was capable of until he had to, Brown could have made that clearer. *This was handled a bit clumsily in the Outer Limits, e.g. when the male lead is getting his hand ground by the foot of one of the goggle-eyed aliens and he screams "Mama!" In the Outer Limits program, a male and a female of each race face off against their counterparts. Here are some pictures from the magazine appearance of "Arena." The earthman wears a spacesuit, but is naked in the story. Fifth, a 5/5 story -- "Vintage Season," credited to Lawrence O'Donnell in Treasury of Science Fiction (1948), its first hardcover appearance. My understanding is that it is mostly by C. L. Moore, although sometimes husband Henry Kuttner is mentioned as co-author. The frequently-mentioned euphoric drink relates to a theme concerned with sensation-seeking and so is more than just an incidental element of the plot. One could discuss the topic of antiquarianism or even the much larger topic of the uses of history as suggested by "Vintage Season." And one could discuss the craft of science fiction writing -- how an author deals with the peculiar challenges thereof -- with reference to this story, e.g. management of point of view and irony, use of authenticating descriptive detail, etc. Here's a couple that were easy to reach. Have some older, cooler ones a little harder to get to. Will do so soon. Dask, I can remember the days when one could walk into a grocery store, convenience store, or drug store and see rotating wore racks stocked with paperbacks that looked like the ones in your illustrations. I suppose some of the younger Chronsfolk can't remember such sights! It could be risky! I remember once I was on a Greyhound bus trip (and I suppose there are American Chronsfolk who don't remember the days when Greyhound buses were available to just about everyone) and had to wait in Roseburg, Oregon, to transfer to a bus going to Coos Bay. I got focused on a rack or two of books such that I missed my bus. Well, I forgot to pick my wife up at the doctor's office once because I got lost in space at the comic shop. Left her sitting in the waiting room for about 45 minutes. If she is like my wife, she promptly, truly, and kindly forgave you; and reminds you about the incident every once in a while! A note on my Conklin notes: I'm reading these stories for fun, not for a project, so I will feel free to bail out if a story isn't pleasing me for some reason. (Sometimes even a pretty good particular story just isn't what you want right then -- I'm sure others know how that goes.) I probably won't report on such stories as a rule. -- but didn't stay with them. Maybe some other time. Funnily enough, these two stories were the MacLean ("Incommunicado") and Knight ("Rule Golden") novellas. Funny, because these authors wrote what I think of as two of my big favorites -- MacLean's "Pictures Don't Lie" and Knight's "Stranger Station." I've liked other stories by them as well.